The WE referred to here, of course, are all the plants in the gardens. Everyone made it through with flying colors, literally! 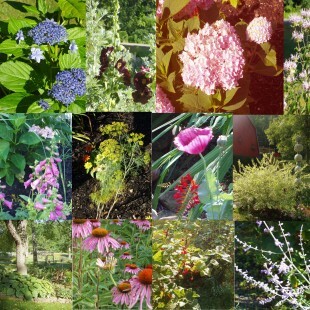 Purple poppies, blue and pink hydrangeas, crimson crocosmia, golden dill with orange zinnias, four different hues of bee balm, and the lovely white of Japanese willow, just to name a few pictured here. A note to Mother Nature ~ Thank you so much for the rain yesterday! A favorite theme among our gardening friends is lily pads, especially when they are used as a water feature in the garden. This summer we are featuring a number of different styles from single pads that rest on the ground in varying sizes from 6 inches to 14 inches which are great for toads to hop in and get wet or for the bees who are among our most important pollinators in the vegetable garden and fruit trees. 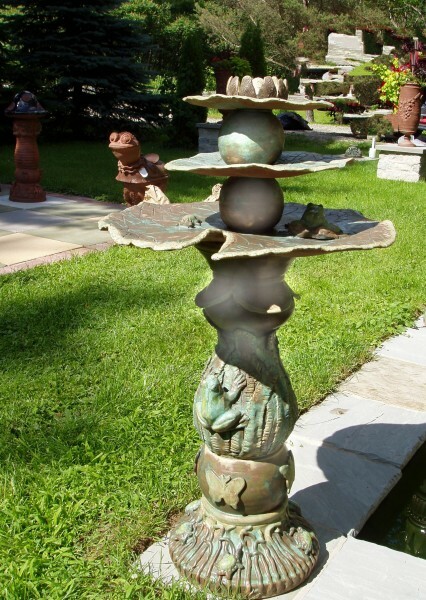 We also feature single and double tiered 22 inch pads on 8 inch high pedestals which work so nicely as a bird bath, and our great big three tiered sculptural bird bath with frog pond design. 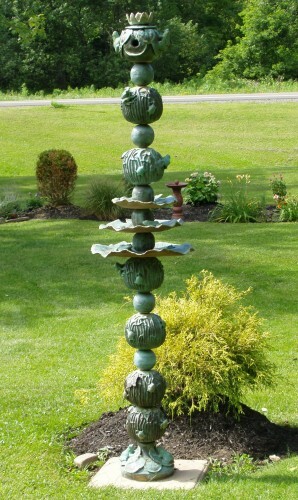 One of our new sculptures for this summer season featuring a bird house on top and levels of water features. Once again, all of our work is frostproof which makes it marvelous because you can leave it outdoors in the winter!!! Who would not love to continue enjoying the garden and its sculptures during the long, long, cold, cold, snowy, snowy……winter?